Gretchen Edwards (@gretchEdwards) is the assistant director of digital engagement at Wake Forest University. Move-in day is an exciting time for any institution. Freshmen and upperclassmen alike look forward to the start of a new school year, and even faculty and staff are ready to get back in the swing of things after the summer. At Wake Forest University, freshmen arrive early and go through five days of orientation programming prior to the start of classes. Move-in day is a special time to celebrate the freshmen and make them feel a part of the campus community. From print media (Wake Forest mailed an actual book about being a freshmen to the class of 2017) to orientation programming, there are a number of ways Wake welcomes new students to “the Forest.” Social media is also an important part of these efforts. How will we achieve those goals? Show new students and their parents a “uniform Wake Forest look” both online and around campus when it comes to social media. As with any event, the hashtag for move-in day is incredibly important. Last year, #wfumovein was the official hashtag. This year the hashtag is #wfu17. 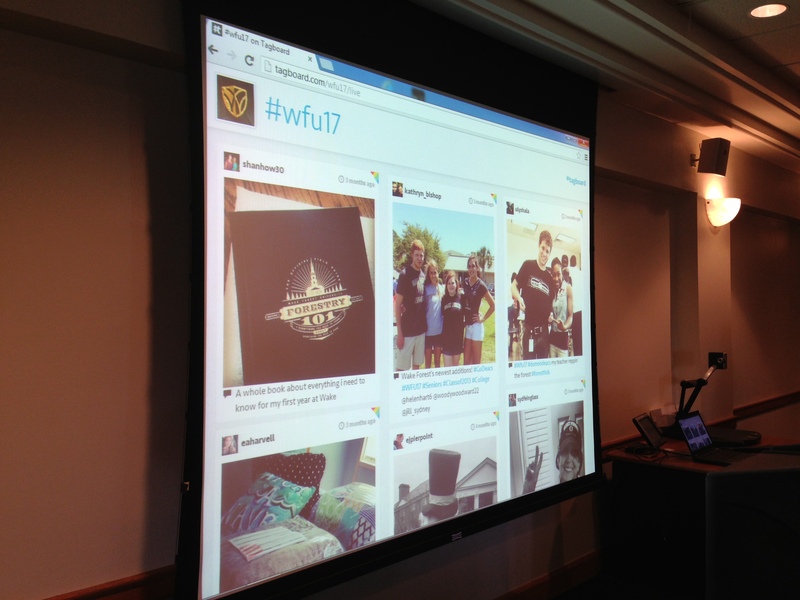 The members of the Class of 2017 were active online for several months prior to move-in using #wfu17. They talk to each other without any prompting, discussing everything from class schedules to roommate assignments to packing to their feelings about leaving home. And they are also tweeting and posting to Instagram using #wfu17. 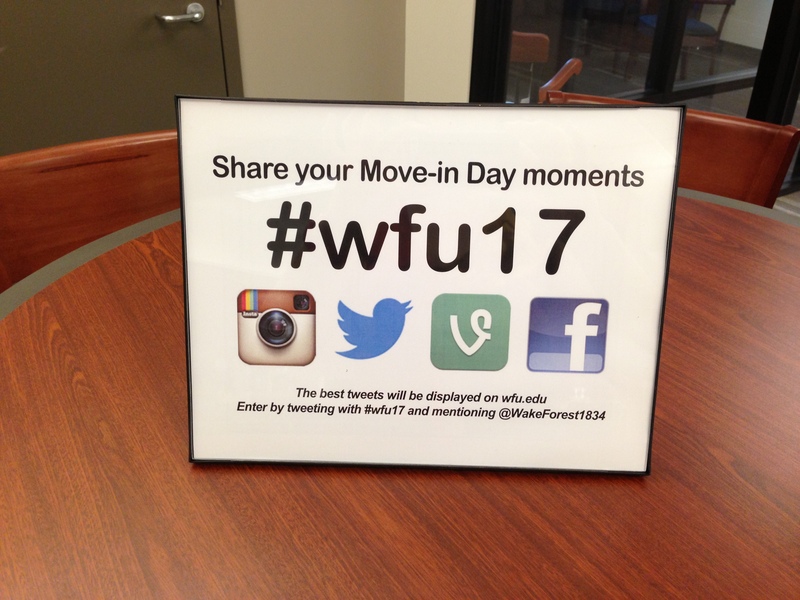 (In fact, there were already 302 Instagrams tagged with #wfu17 as of Aug. 20, two days before move-in.) It’s great—@WakeForest1834 has been having so much fun engaging with these students. So back to the hashtag choice. These students are the Class of 2017, and I saw no reason to try to drive adoption of a different hashtag, especially since #wfu17 makes sense. Whether or not you’re a member of the Class of 2017, you can still use the hashtag on move-in day. Finally, the social media event displays around campus are a big part of both promoting the hashtag and incentivizing user-generated content. Using #wfu17 allows me to pre-populate those displays with great content before they go live. On move-in day, flyers promoting the hashtag were posted at campus locations where freshmen have to make stops. The hashtag was also integrated into the social media event display. I’m most excited about the #wfu17 social media event displays. They support all of the day’s goals, from welcoming students to incentivizing user-generated content. There are a variety of social media event display tools to choose from. I researched a number of them before deciding to use Tagboard. Tagboard met my basic requirements: budget-friendly, easy-to-use, live-updating, integrates multiple social networks and (the most important) it provides content moderation. The social media event display was shown on a variety of screens, from digital televisions to projectors. It was also available via a campus cable channel which gave us access to additional TV screens that we wouldn’t have been able to use otherwise. The Tagboard was also on the web at tagboard.com/wfu17. The live mode was enabled on screens around campus so that content would update in real-time. The web version requires the user to refresh the page manually. The #wfu17 Twitter contest was another engagement activity. It was open to the entire Wake Forest community and easy to enter. To enter, participants submitted a move-in day related tweet with the hashtag #wfu17 and mentioned @WakeForest1834 on Aug. 22. A winning tweet was selected every so often depending on the number and quality of submissions. 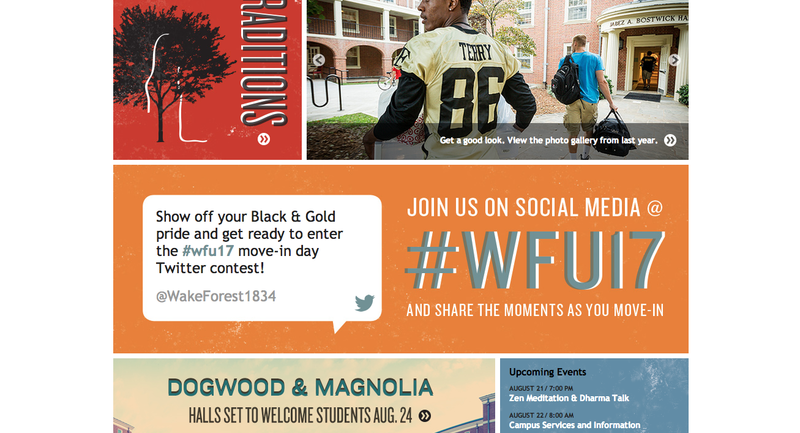 When a new winning tweet was added to the homepage, I took a screenshot of it and @WakeForest1834 congratulated the winner on Twitter. The contest was announced Monday, Aug. 19, and was promoted on social media and in our print flyers. As the #wfu17 hashtag was already popular, I started tracking it on Aug. 8. This way, I can compare the volume of tweets on move-in day to a regular day in August. For instance, there were an average of 49 tweets tagged #wfu17 each day during the past week. Success on move-in day would be anywhere from 300 to 600 tweets tagged #wfu17. Bonus if #wfu17 trends locally. How did I choose those numbers? There are 1,200 Wake Forest freshmen. According to the recent Pew Internet survey “Teens, Social Media, and Privacy,” 24 percent of online teens use Twitter. That would mean about 288 Wake Forest freshmen use Twitter. (I get it’s not ideal to only use one source, but I had to start somewhere.) If this holds true, it seems reasonable for that number of people to produce 300 to 600 #wfu17 tweets on move-in day. Furthermore, our recent social fundraising campaign #Wake500 earned 329 tweets from 169 contributors. Commencement earned more than 1,100 tweets from more than 600 contributors and the hashtag trended locally. I think move-in day will fall on the lower side of the middle of those two events. Commencement had the benefit of a captive audience waiting for tweet(s) to appear on the jumbotrons, whereas the move-in day social media displays will be spread out around campus and appear only on TV screens or classroom projectors. I’ll take a look at the number of followers before and after move-in day, so I can account for a day-of increase. A number of freshmen have already followed @WakeForest1834, so even a small uptick of 10 to 30 new followers would be a success. I’ll do a before and after move-in day search, so I can account for the number tagged just on move-in day. (As of Aug. 20, there were already 302 photos tagged but they will not count toward the move-in day total.) There were more than 500 tagged for Commencement. Fifty to 100 new #wfu17 Instagrams on move-in day would be a success. Again, Hashtracking. 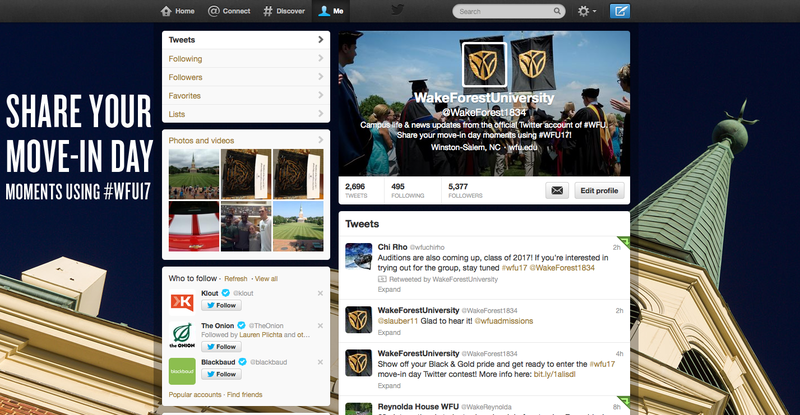 The service allows me to search for tweets tagged #wfu17 AND that include @WakeForest1834. (Requirements for tweets to qualify for the contest.) Eighty to 100 entries would be a success. Did they stop and look at it? Did people do anything else interesting that I didn’t expect? Regardless of your role on campus, move-in day is a whirlwind. If you’re a community manager, lead with a defined strategy and plan for engaging the campus community online. Then watch as students express themselves. After all, they’re about to begin the best four years of their lives. And that’s definitely something worth talking about.